Photo: Our Philippines farmland includes an 85-tree banana grove, providing a consistent harvest of fresh bananas for our children’s programs year-round. Our native team on the island of Cebu reports that a severe storm with heavy rains and strong winds began on January 9th and lasted almost 2 weeks. Thankfully, our farmland enterprise received only minor damages – our fishery overflowed because of the heavy rains, resulting in a loss of about 500 fish. But once the rains subsided, our fishery bounced back quickly to normal operations. However, we did make a change to our sales plan: instead of doing mass harvests to sell to market vendors, we are now selling smaller harvests on demand to families and smaller vendors. For example, a recent sale of 350 fish to a local vendor who picked up the fish directly from our farm profited our programs $113. We are thankful for these profits since the funds are used to make improvements at our Children’s Hope Center on our Cebu campus. The supply of fish also adds a protein-rich ingredient to our children’s diets. 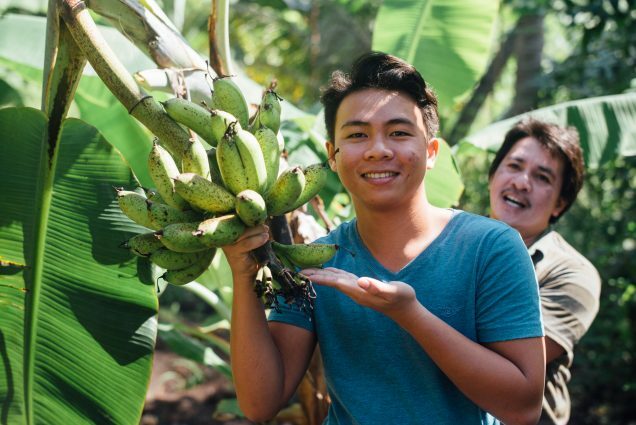 Our banana grove continues to flourish with 85 trees which are harvested weekly — our last harvest yielded 7 large stalks of bananas. This nutritional staple in our children’s diets provides them with a good source of potassium as well as other nutrients such as magnesium, folate, vitamins A and C, and dietary fiber. Our coconut grove is also doing well — we look forward to harvesting our 85 mature coconut trees in May. We have 115 coconut trees total, including 30 new coconut trees which we planted 10 months ago — the new coconut trees will mature in 7-8 years. The younger coconuts are used in the children’s diets — after the nuts are opened, the soft sweet meat is delicious to eat, and the juice is refreshing and hydrating. Our goat farm project is another one of the many agricultural projects located on our Cebu campus which provides food for our program recipients and supplements funding for our Cebu programs. We currently have 10 goats because we recently sold 3 goats at market — we received $165 as profit. Last October we received more profits at market when we sold 10 ducks for $26 and 20 chickens for $104. Then 2 weeks ago we sold 10 more chickens for $58 and 41 ducks for $106. The chickens and ducks are part of our free-range poultry farming project at our farmland enterprise — they are easy to maintain and care for, and they multiply quickly, yielding small but fast profits. 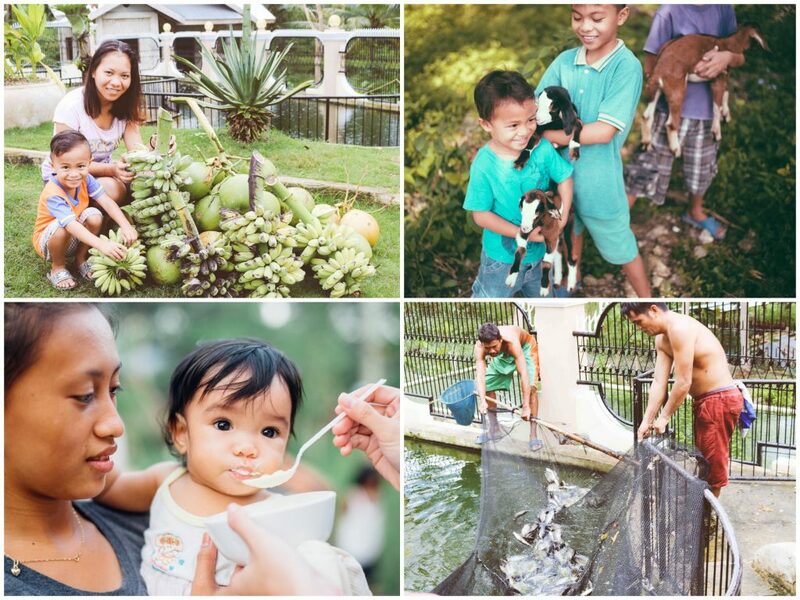 Photo inset: (Top-left): Our children and our native team are grateful that our last banana harvest yielded 7 large stalks of bananas. (Top-right): This child is thankful for our goat farm project, which is one of the many agricultural projects located on our Cebu campus which provides food for our program recipients and supplements funding for our Cebu programs. (Bottom-left): This mother and child benefit from one of our frequent children’s outreach days on the island of Cebu, which includes nutrition and hygiene services for children suffering from extreme poverty. (Bottom-right): Our native team’s 70,000 gallon fishery project yields several tons of fish per year, not only providing funding for their programs, but also a protein-rich ingredient in our children’s meals. In other news, we are making repairs to our piggery to remove rust, do some repainting, and replace weak bars with stronger ones. Due to the repairs, we recently sold our existing litter and currently only have 1 pig, but after the repairs are completed we will buy 9 new piglets. We are also making repairs to our hen house project to remove rust and replace bars that have broken. Once those repairs are completed, we hope to raise $1,940 to purchase 200 pullet hens, which are bought near maturity, so we only have to wait 3-4 weeks before they start laying eggs as opposed to “layer chicks” that take several months to feed and raise before they become egg-bearing hens. In addition, there has been a local shortage of layer chicks on the island of Cebu because the main breeder is rebuilding his facilities. Thus, pullet hens will enable us to get our hen house project back up and running smoothly for daily profits lasting two years or longer, once the repairs to the hen houses are completed. We are happy to report that our Children’s Hope Center on the island of Cebu is doing well — 40 children are enrolled in the Hope Center’s after-school care program which includes homework tutoring and other activities, along with snack and meal services for children suffering from extreme poverty. The program model also includes a VBS-style outreach program on Saturdays with Bible study and games such as Bible memory verse games, sack races, and tug-of-war. In fact, we recently started a new VBS outreach program for 193 children in a nearby mountainous village near Dumanjug. We also offer these children nutritious fresh-cooked meals, juice, and hygiene items such as toothbrushes and toothpaste. Thank you for your prayers and support which enable our native team to continue their hard work — enriching the lives of our children, breaking the crushing cycle of poverty, and rescuing them from dangerous child labor.